Nobody Owens, Bod to his friends, is a normal boy growing up in a decidedly abnormal way. 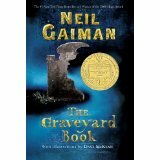 The Graveyard Book, by Neil Gaiman, opens with the horrific triple homicide of Bod’s family when Bod is only a year or so old. Through a series of miracle-like coincidences, baby Bod makes his way into a nearby graveyard at the exact same moment the man Jack is committing the murders. Once the residents of the graveyard realize the murderer is still searching for the innocent and helpless little boy, they decide to protect him, granting him the Freedom of the Graveyard. An ominous beginning for such a future hero. The Graveyard Book follows Bod through childhood and adolescence, adventures and education, and finally to his inevitable encounter with (not really a SPOILER if you understand story structure at all) the man Jack. 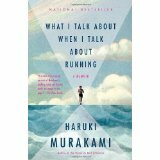 I liked this book. The world of the Graveyard was fully fleshed out (pun intended) and felt real and a little magical. The story is told through third person limited perspective, and this worked really well because it kept the mystery in the context of Bod’s perception. Bod doesn’t receive a normal education, and therefore he doesn’t act or respond to things in the way a “normal” child would. He is mature for his age in some ways, and yet believably naive in others. My only minor complaint is that I don’t think this is a Children’s Book, as it’s being categorized but I’m kind of a prude when it comes to dealing with death. The novel is, at first, a series of vignettes, introducing character after character. It also spans several decades, and jumps back and forth to an almost dizzying effect – much like the circus itself. I loved this book. It set out to tell a fantastical fairy tale, and it accomplished that in the most charming and vivid way. The imagery was everything I had hoped for when I picked it up at Barnes and Noble. 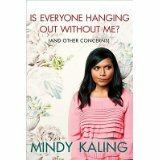 I would recommend this book to just about anyone. That said, the novel is not without faults. Because it is chalk-full of colorful characters, and because it jumps through time in nearly every chapter, the dizzying effect makes it difficult to narrow down an emotional attachment to anyone in particular. Though the two protagonists are obvious from the start, Morgenstern does not spend a terrible amount of time crafting their emotions or motivations. Instead, she focuses on their technical training and their execution of beautiful illusions. 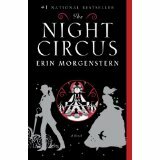 She focuses on the circus itself and it’s dreamlike mysteries. She focuses on those just outside the circus who are affected by its wonders. So when the two magicians finally fall in love, though it feels natural, it also feels a little empty and unearned. 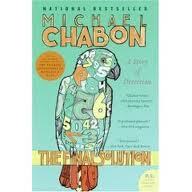 I picked up The Final Solution, by Michael Chabon, not knowing anything about it other than the fact that it was 131 pages, including some illustrations, and it was written by a writer whose work I have enjoyed in the past. I wanted to pick something that would be quick (because, yes, my total number of books read so far is a little behind), but smart. The back page summary seemed interesting enough. A reclusive retired detective living in the English country-side is more content with bee-keeping than interacting with his fellow man. Into his life walks an intelligent but mute boy and his exotic African parrot. The boy is a Jewish refugee from Nazi Germany, and his bird never leaves his side, repeating a random string of numbers in German regularly and peaking the curiosity of several characters. When a murder occurs, and the bird is stolen, the detective is recruited to help solve the case. And the detective is Sherlock Holmes. It’s never stated, but it’s incredibly obvious, and had I known I probably would not have picked this book. I’ve never read a Sherlock Holmes mystery, and as such I have a nagging feeling that I probably missed a lot of references in this short little book. The mystery itself is fine, I suppose, if you like that sort of thing, but honestly, I’m finding that I don’t. I think my issue is that I love character driven stories, and this novella is framed through a previously developed character. Each additional character in the novella, including the parrot, has his own motivations, but “the old man” is the protagonist grounding the story. Having not read the source material, I felt a bit cheated. The story seemed almost hollow somehow, which I’m sure was not Chabon’s intent.